How Much Swimming Equals Running 5 Miles? Swimming and running are both great ways to meet your daily cardiovascular exercise requirements. Due to the resistance of the water and involvement of your upper and lower body, swimming is also a good full-body, muscle-strengthening activity. As swimming places less impact on your joints, it is a good option for people with joint problems. Despite these benefits, however, you need to swim for a longer period of time to burn the same amount of calories that you do over a 5-mile run. The amount of calories that you burn while performing a certain activity varies with your age, weight, the amount of time that you spend on it and your exercise intensity level. 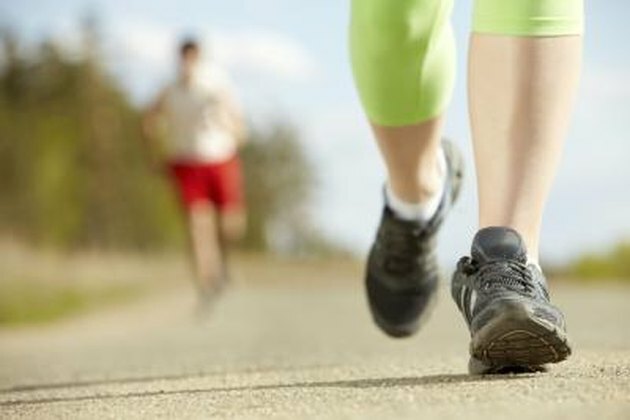 Because of this, running five miles burns different amounts of calories for different people and at different paces. A 150-lb. person, for example, burns approximately 576 calories over an hourlong, 5-mile run. Running the same distance in 30 minutes increases the amount of calories that she burns to 612. The amount of calories that you burn while swimming is a product of the same factors that affect your energy expenditure while running. Due to its lower impact on your body, swimming helps you to burn fewer calories at the same intensity level and over the same period of time as running. For a 150-lb. person, 30 minutes of swimming at a moderate pace burns approximately 206 calories, while 30 minutes at a vigorous pace burns 333. As such, this person would have to swim for at least 80 minutes at a moderate pace or 50 minutes at a vigorous pace to burn the same amount of calories as an hourlong, 5-mile run. 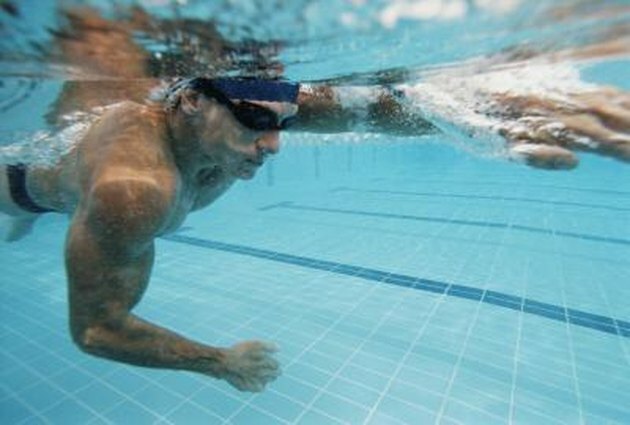 While it is largely a product of effort and time, the amount of calories that you burn while swimming changes with the type of stroke that you perform. 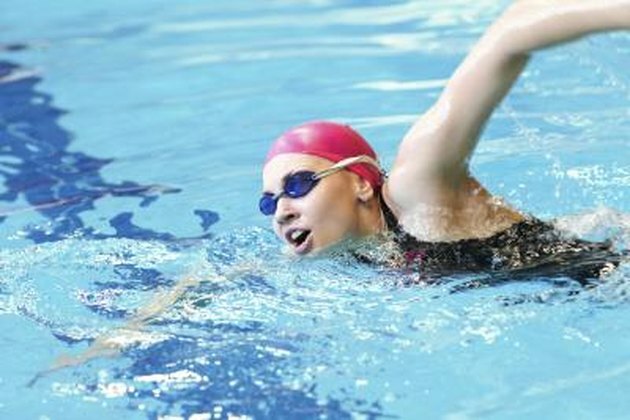 In an online interview with Kate Rew of "The Daily Mail," swim instructor Steve Price states that good freestyle swimmers burn as many as 100 calories every 10 minutes. If you perform the butterfly stroke well, this value increases to as much as 150 calories per 10 minutes. Working different muscles, the backstroke burns approximately 80 calories every 10 minutes, while an intense, well-performed breaststroke burns only 60 calories over the same period of time. Performing different stroke types either increases or decreases the amount of time that you need to swim to burn the same amount of calories as in an hourlong, 5-mile run. Using the above values, a good freestyle swimmer needs to swim at the same pace for approximately 60 minutes to burn as much as a 5-mile run. By performing the butterfly instead, you reduce your swim to 40 minutes while burning the same amount of calories. Good backstroke swimmers take a little more than 70 minutes get an equivalent workout, while breaststroke swimmers need to swim for nearly 100 minutes to burn the same amount of calories as in a 5-mile run.